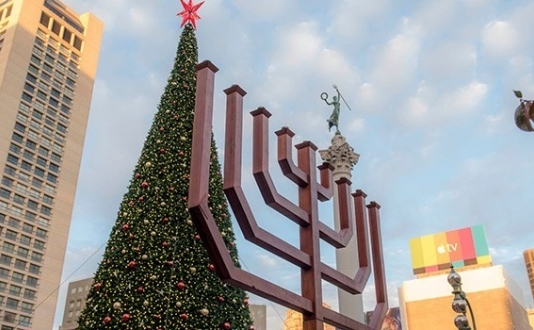 Celebrate Chanukah 2018 with the 44th annual lighting of the 25-foot tall mahogany Bill Graham Menorah in Union Square. This San Francisco tradition, the brainchild of rock and roll concert promoter Bill Graham, begun in 1975. Lighting ceremonies take place from December 2-9, at approximately 5 pm on most days (Friday is at 3 pm and Saturday is at 8 pm). Please note, most days, music and ceremony begins 5 pm and actual lighting of the Menorah is approximately 5:30 pm. Bill Graham Festival of Lights at the Fillmore 6:30 pm – paid tickets here.